Visiting Napa Valley’s many delicious restaurants is one way to taste the local flavor. But if you’re looking to experience the cuisine, check out one of the numerous cooking classes you can take during your visit. 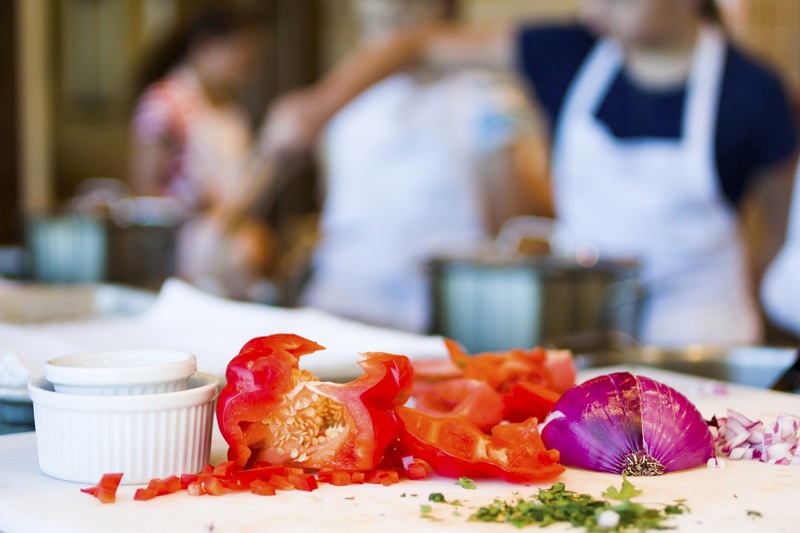 The following Napa Valley cooking classes go a step beyond creating a recipe from a cookbook. How? Learn more and start planning your trip to this mecca for wine and food lovers. For information on other unique Napa Valley experiences, such as Napa Valley cooking classes, download our free Vacation Guide! Come and enjoy a fun and flavorful hands–on cooking class with Julie Logue-Riordan in Napa, CA. 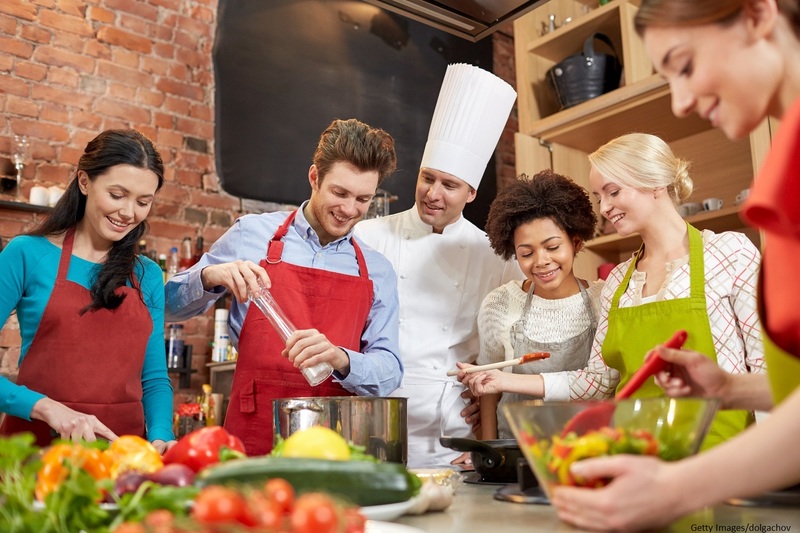 Cooking with Julie offers a variety of classes from a relaxed group setting to team building scenarios that help create a bond between coworkers or clients. Depending on the season, you can join Julie for a tour of Napa Valley’s farmers market and local artisan displays, followed by a hands-on cooking class. Along the way, you will learn tips on how to select and prepare fresh local produce. No matter what class you pick, you will have an unforgettable experience cooking side-by-side with Julie. The Napa Valley Cooking School located at Napa Valley College offers a Food Enthusiast Program for locals and tourists. The courses are taught by guest chefs from around the North Bay area. Napa Valley Cooking School students provide assistance. Depending on the chef and style of cooking selected, you will either be paired with a small group or work individually. The kitchen’s intimate culinary setting allows the chef to work with you one-on-one periodically throughout the class. This is guaranteed to be a fun and unique experience that ends with an amazing meal. Visit their website to view the class schedule. The Culinary Institute of America at Greystone is located in nearby St. Helena. This impressive campus, complete with a castle-like main building, overlooks Napa Valley. It boasts 15 acres of vineyards and an extravagant herb garden. CIA offers Saturday classes in the kitchen. You can immerse yourself in this rich culture of food and learn the reasons behind certain methods of cooking. 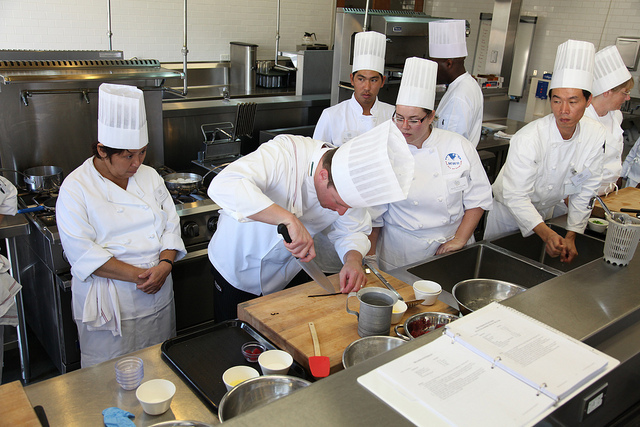 Each class is taught by one of CIA’s famous chefs. The chef’s expertise combined with fresh local ingredients makes CIA an ideal location for a culinary vacation. To find a list of their upcoming classes, visit their website. Gourmet Retreats offers a one-day Wine Country Class at CasaLana in nearby Calistoga, CA. You will experience a repertoire of unique demonstrations and hands-on experiences as you prepare various dishes. The classes are hosted by CasaLana founder, Lisa Richardson. These culinary courses are limited to 8 participants. They begin at noon and usually last about 5 hours. Here you will learn to cook with passion and get to know the different techniques taught by renowned CasaLana Chefs. Lana also offers private and team building classes. At Silverado Cooking School, you won’t just be attending a Napa Valley cooking class, you’ll be attending a culinary experience. This hands-on adventure lasts 3 to 4 hours and is filled with fun, amazing food, and delicious wine. You will cook with seasonal produce harvested straight from their farm the day of your class. Silverado Cooking School offers a wide variety of courses to choose from for every experience level. After checking out one of the Napa Valley cooking classes, and filling up on gourmet food and wine, come check in at Churchill Manor. Our 19th-century bed and breakfast mansion offers a quiet, romantic retreat. You will find that Churchill Manor is a twist of Old-World craftsmanship with modern amenities. Explore our luxurious rooms and check availability. Don’t forget to download our free Vacation Guide for tips on the best things to do and see during your stay.